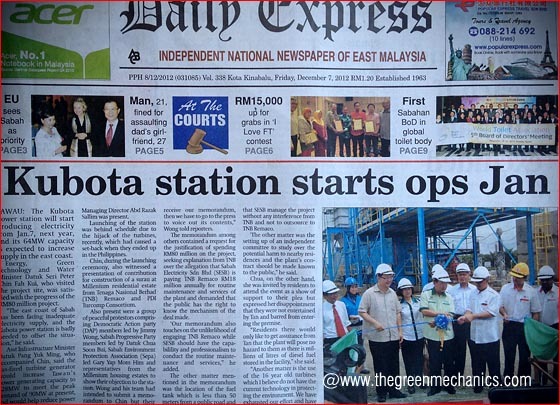 Exactly 1 month ago SESB said in a statement that the 64MW power plant in Kubota, Tawau will start operations. If you recall, this plant was supposed to have started operations in June 2012. But due to the hijacking of the vessel ferrying the plant equipment intended for this power station, it is understandable. Hopefully they are true to their words this time and starts operating it this month.The hijacking incident is not totally beyond control as TNB has the technology and money to ensure safety of its vessel. We are currently facing the possibility of load shedding and power rationing due to the failure of one of IPP's generators in Sepanggar causing capacity shortage of 95MW. We can't afford further delay. BTW, the turbines are understood to be 16 years old, so, I believe this is only for temporary measure by SESB/TNB. Tawau: The Kubota power station will start producing electricity from Jan.7, next year, and its 64MW capacity is expected to increase supply in the east coast. Energy, Green Technology and Water Minister Datuk Seri Peter Chin Fah Kui, who visited the project site, was satisfied with the progress of the RM80 million project. "The east coast of Sabah has been facing inadequate electricity supply, and the Kubota power station is badly needed to offset the situation," he said. Asst Infrastructure Minister Datuk Pang Yuk Ming, who accompanied Chin, said the gas-fired turbine generator would increase Tawau's power generating capacity to 128MW to meet the peak demand of 90MW at present, and would help reduce power outages in the district. Sabah Electricity Sdn Bhd Managing Director Abd Razak Sallim was present. Launching of the station was behind schedule due to the hijack of the turbines, recently, which had caused a set-back when they ended up in the Philippines. It might be 16 yrs old but it haven't been run much,bought after the 1993 blackout and first installed in Kapar Power Station and then relocated to Telok Ewa Power Station in Langkawi as a standby set.